Pull-ups for Patriots is a charity event being held to raise money for Hope For The Warriors, Augusta Warrior Project, and several non-profit organizations that benefit servicemen and women stationed at Fort Gordon, GA. A pull-up competition between participating servicemembers will take place at CrossFit Good Vibes in Grovetown, GA on Saturday, October 1, 2016 from 1000 to 1300. We will be competing to see who can do the most pull-ups in 3 max sets during a 10 minute period, as well as seeing who can individually raise the most money for charity. Select a command to donate or pledge! The original pull-uppers defending their title as champions this year. The 3rd Intelligence Squadron is squaring off with the marines this year! Can they overthrow the reigning champion? These Marines heard about Company D and just had to get in on the glory. May the best Marines win! The 31st Intelligence Squadron can't be show up by their wingmen in the 3rd! Which squadron will come out on top? Funds raised will be shared between Hope For The Warriors, Augusta Warrior Project, and non- profit organizations that directly benefit the servicemembers in the participating units. All Hope For The Warriors® programs serve post-9/11 active duty, National Guard, and reserve service members and veterans from all branches of the military. Programs also support the entire military family, families of the fallen, and military caregivers. More info can be found on the Hope for the Warriors website. The Company D Command Association is a nonprofit organization (§501(c)(3) status) that exists to benefit members of the Association and other charitable organizations. 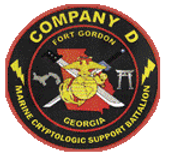 Their main purpose is to provide funding for events and activities for the Marines of Company D as well as making donations to organizations such as HFTW or Toys for Tots.